Children to their parents: stop teaching and take note. As dads, it may feel as though we're always trying to teach our children. Let's face it, we're role models. At any moment in time, our kids are likely watching our every move, soaking up every behavior they see - both good and bad. We're not perfect; we've all said and done things in front of our children we likely weren't proud of. We are all guilty, and not to make excuses, but the pressure of having little eyes watching us at all times can be stressful. Stop teaching and learn for a change. Ironically, what may be lost in all of our teaching efforts is our ability to learn from our children. When I tell people I've learned more from young children than I have from all of my education, they tend to laugh and not believe me. I understand their hesitation, considering that I have two bachelor’s degrees and a masters degree. However, I firmly believe that I learned more about life from observing children than from anything else. There's so much we can learn from our kids. 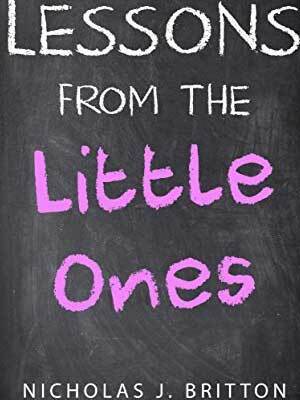 Author Nicholas Britton explores this potential in his new book, Lessons from the Little Ones. What if we learned danger isn't dangerous and that taking risks can just be part of life (and success)? Part self-help, part life lessons, Nick's book is full of everyday lessons we should be learning from the very humans we try to teach. So take off your parenting hat for a few minutes and download this book. You'll see your children and their role in your life in a whole new light. Is our own success determined in childhood? These aren't basic lessons, but are in fact in-depth principles that can be more difficult to master than you'd think they should be. I'm a very goal oriented, driven guy. I firmly believe that without a desire or willingness to achieve goals and dreams, they'll likely just your goals and dreams, and do ever materialize. Most of us live in a world and a society where we strive for comfort and safety. We emphasize complacency and stability. We sell ourselves (and each other) on these goals in an attempt to justify our lack of ambition or success. Sure, once a year we may have a spurt of motivation and dream up a few New Year's resolutions. These dreams rarely become a reality and studies show that a majority of peoples' New Year’s resolutions are forgotten before March 1st. The fact is, we are suppressing our own potential. It happens to the best of us, and often without us even realizing it's happening. It's a slow process that actually takes root in our childhood. Our children are designed to succeed...if we let them. Our children are designed for success. They are given an amazing combination of tools and skills to use, the perfect package for them to reach their full potential. Children use childhood to learn how to use these tools and fine tune them in a way that supports their unique needs and abilities. There are no limits for what a child dreams of accomplishing. Over time, society begins to influence and shape our kids, without us even knowing. These tools are slowly lost even though we worked so hard to build them. Their once big, beautiful dreams are overshadowed by 'reality' that is pushed on us. Pressure and limiting beliefs let everything we once thought we would do, fade into the distance, further out of our reach. Never let go (of your dreams). No one ever completely forgets their dreams. No matter how much we let them slide, how far they get away from us, or how long it's been since we've talked about them, they are still there. There's a special place in our hearts for the desires and passions, we hold them very close to our heart. One of the greatest parts of being a parent is that you learn to live vicariously through your children. Their dreams will become yours. In order to truly be successful as a parent, you need a constant willingness to learn from your children, and to always be there for them. They, in turn can be there for you, too. What do you think? What important lessons have you learned from your children? Be sure to leave a comment below! Nick Britton has served multiple positions in his career, however, being a preschool teacher was one of the greatest. He has written two bestselling books, “Children Know Success. Do you?” & “Lessons from the Little Ones.” He has several professional publications, hosts weekly networking events, and has given public speaking engagements in multiple regions of the country and can be reached on twitter @njbritton or via email at info@nickbritton.com.